Down from New York, Gnoccheria by Luzzo’s joined us today in the test kitchen! Anisa Maloney, Co-Owner, along with Chef Michele and Manager, Tonino, gathered around as we demonstrated several of our Gnocchi machines. As you can tell from their name, Gnocchi’s the name and specialty is the game! Their whole restaurant is geared around gnocchi specialties, how neat is that?! 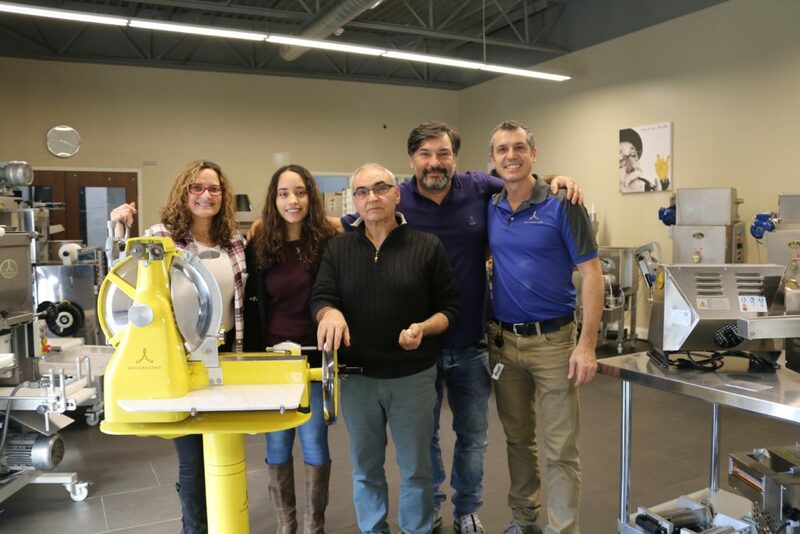 We started off with our Co-Extruder, AEF150 Gemellla, which can produce anything from stuffed gnocchi, to stuffed meatballs, and even things like stuffed cookies and fig bars. It extruders and fills all-in-one shot. Our AGX2 got some attention next with a potato ridged gnocchi. The automatic flour duster continuously sprinkles flour to avoid sticking, which makes life easy! To top it all off, we ended with delightful, freshly sliced prosciutto demoed on our Arcobaleno Yellow AV350. Needless to say, it was enjoyed by all! If you’re up in the New York area, be sure to stop by and check them out!